Nike is working on a way to keep their NBA jerseys in one piece. There have already been five incidents this season of uniforms being shredded and torn during the course of a game. We are very concerned to see any game day tear and are working to implement a solution that involves standardizing the embellishment process and enhancing the seam strength of game day jerseys. The quality and performance of our products are of utmost importance and we are working with the NBA and teams to avoid this happening in the future. Nike signed an eight-year, $1 billion deal with the NBA that began this past year. Adidas was the previous uniform provider. NBA jersey ripping has happened before. It occurred with former Sixer Elton Brand when his shirt was torn by current Sixer Amir Johnson, who was then playing for the Raptors. But it doesn’t happen regularly. Nike had jersey problems in the past with the Eagles. Back when the team switched over to the “Elite 51” fabrication, the team wore their white and black jerseys for the first 10 games of the season. The Midnight Green jerseys didn’t debut until the second half of that season because it was a custom color for Nike and required extra time to make. Allen Iverson was basically the face of Reebok from 1996 until the mid-2000s, and they were still putting out new Iverson sneakers (not re-issues) until 2009. There was a period of time where every family within the city limits of Philadelphia had at least one pair of these in the house, and to this day, Iverson (along with Shaq) is probably the one athlete most affiliated with Reebok in people’s minds. That is why Iverson’s lawyer made a whole fuss over those Nike shoes above. According to the Associated Press, those Nike sneakers — part of the Zoom Flight ’96 collection — will no longer be released. Nice Kicks described the shoe as an “imagined Allen Iverson PE of the classic 1996 hoops shoe, featuring a 76ers color palette of blue nubuck with red and white accents … a speckled midsole, ice clear outsole and AI’s #3 on each heel.” Iverson’s lawyer described the shoe as an unauthorized use of Iverson’s identity, likeness, and persona. Nike says the shoe will still come out, but in “other color schemes” and presumably without the #3 on the back. 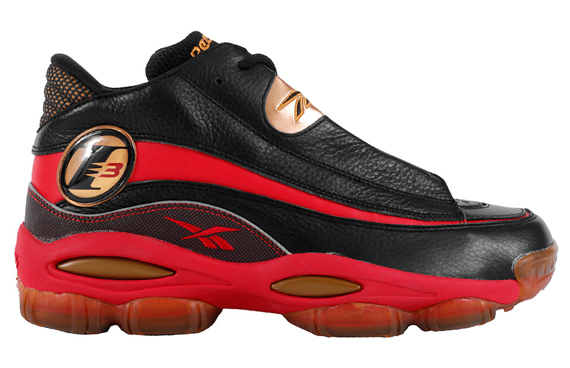 If you’re really dying for an Iverson sneaker though, there are always the old stand-bys. First went the statue of the emperor, next comes his clothes? O'Brien also told the parents that he has talked to Nike about changing Penn State's plain blue and white uniforms, a staple of the program for decades under former coach Joe Paterno. He also said he's looking to put names on the back of the jerseys. Quick Analysis: They're really in a damned if they do, damned if they don't situation. If they keep the current uniform, they're effectively wearing a Navy and Blue (Scarlet) Letter every time they take the field and it's just "for Penn State, it's still business as usual." If they scrap (or fundamentally modify) their current uniforms, it appears reactive, as if Penn State really isn't bigger than its "Institutional Failure" of the last 15 years. As to adding player names to the jerseys? Cynically, that seems like it could an effort to be more in-tune with the supposed "look at me" generation of recruits, and this makes them more easily identified (and marketed) to the NFL. I don't buy this completely, being that sports, even the NCAA, has had "showboats" out there well before the last ten years or so, and this supposed "Golden Age of College Sports" where it was devoid of such characters never really existed, anyway. The uniform "corner" of the internet has been abuzz about the concept of a change happening for a few weeks, and the consensus was generally to keep the current uniforms as-is, but change the helmet from white with a blue stripe to blue with a white stripe. Subtle, yet still completely obvious. "We've changed, but but we're still the same." (or some other hokey-sounding but genuinely heartfelt marketing slogan). Finally, let me point out that Penn State's Uniforms haven't been completely immutable. Just last year they got rid of the contrasting collar and sleeve details. Of course, that was to make the uniforms look more, well, "traditional," but small (read: tiny) changes have occurred. "I have been deeply saddened by the news coming out of this investigation at Penn State. It is a terrible tragedy that children were unprotected from such abhorrent crimes. With the findings released today, I have decided to change the name of our child care center at our World Headquarters. My thoughts are with the victims and the Penn State community." "Other than my parents, my college coach, Bill Bowerman, was the biggest influence in my life. Bill Bowerman and Joe Paterno shared some great qualities. Throughout Joe Paterno’s career, he strived to put young athletes in a position to succeed and win in sport but most importantly in life. Joe influenced thousands of young men to become better leaders, fathers and husbands. According to the investigation, it appears Joe made missteps that led to heartbreaking consequences. I missed that Joe missed it, and I am extremely saddened on this day. My love for Joe and his family remains." For the second day in a row, we begin our (reduced holiday week) coverage with a DeSean Jackson video. This one, a cameo in an (awesome) new Nike commercial, entitled Game On, World, which pays homage to Mario and other platform games. D-Jac cameo at around the 20-second mark, just before the runner hops down the pipe but after the yoga pants tight shot we’re treated to at :22. Enjoy. I'm really, really surprised Kyle managed to not open his earlier article with one of his patented, lengthy comparisons between some sports-related event and some (hypothetical) relationship or "girl" story with expectations as high as they were. It would've practically written itself. Of course, the high expectations were generated completely by Nike (and some widely circulated fan renderings made in the style of Nike's "Pro Combat" NCAA uniforms which were frequently and erroneously reported as "the 2012 Nike uniforms" well after they were confirmed to be fanmade), as there's simply too much money in the NFL to rock the boat. Patting myself on the back, I'll point out that I predicted the uniforms generally wouldn't change. For what you care about, as far as we know from what we've seen so far, the Eagles uniforms aren't changing at all this season. Being that Nike only showed the green over white combination (more on this below) and it didn't change anything on that combo (in fact, according to Nike Corporate write-up for the Eagles, they "have chosen to stay with their traditional design aesthetic as well as their former uniform fabrication this year," it's safe to assume the Eagles other components (white jerseys, green pants, black alternates, assuming those ever make an appearance again) aren't changing either. That's it. End of story. The best way to analyze today's event is to figure out what it wasn't. Yesterday's event was not for football fans. Every fan wanted to know what their team's "new" uniforms looked like. Nike only showed one combination for each team. Of course, the reason for that is twofold. 1) With 32 teams and multiple jersey/pants combos for each team, there are simply too many combos to show in-person (the Rams have seven combos which they regularly trot out, for example), but even the Nike website and store show only the primary/color jersey for each. OK, maybe the merchandise/material isn't available yet (these are two of the largest brands in the world, get your stuff together), but computer renderings could have been made for publishing on the Internet, a la an official style guide. Oddly, there are some substantial uniform updates for 2012 which weren't even mentioned on the 3rd. The Jaguars will be adding a black alternate to their current set for the 2012 season, so there could be other notable updates for which teams want to control the release as opposed to Nike or the NFL. 2) There was nothing "new" about the uniforms from a fan's perspective (other than for Seahawks fans, of course). If recaps of the event included lines like, "And after showing the Rams 5th effectively unchanged combination of 7, this reporter's eyes began glazing over," it'd ruin the coverage. Instead, we get reporting(?) on how these uniforms will "usher in [a] new era of sportswear" (note: they won't). Yesterday's event was not for the NFL. The event was a Nike commercial where they could push their brand values of performance, etc. in exchange for the $1.1billion they (reportedly) spent for the NFL license. That's all well and good (capitalism! ), but that's all it was. Fans don't care that the new fabric is however many percent lighter or better at wicking moisture (unless they're materials science engineers). It's simply means to an end for associating all of Nike's products with "faster, lighter, stronger." Again, that's fine, but the "new" uniforms aren't a big deal to anyone other than Nike (or Seahawks fans). To talk about this "changing everything" or "the game never being the same"…geez, slow down, Nike. Here they are, the new Philadelphia Eagles Nike jerseys, and they’re exactly the same! Today at a press conference that mystifyingly wasn’t shown live on the NFL Network, the NFL and Nike unveiled the new jerseys to be worn by all 32 NFL teams. Previously, as you likely already know, teams wore Reebok jerseys. Now it’s Nike’s turn, and from the looks of things, they were much more conservative than they were with the NCAA. This is disappointing, to say the least. I wrote at length here about how the Eagles would benefit greatly from a brand facelift, which could have largely been accomplished by refreshing their jerseys. With Nike taking over jersey design this year, it seemed like a good time to do just that. I actually like those, and wanted to see something similar, or at least as drastic, for the Eagles. Oh well. We’ll have links to purchase when the jerseys go on-sale soon. About the only things that are new for the Eagles are the cleats and gloves, which you can view after the jump. Somewhere, our resident uniform expert, Dan Fuller, needs a clean pair of shorts.